The first issue of the Institute's newsletter Connections for 2019. As well as all our regular items such as details of new projects, completed projects, engagement activities and awards & appointments and other Institute news, this issue contains a special 16 page insert on the Fish Passage 2018 conference which the Institute co-hosted in December last year. This international conference, which attracted 359 delegates from over 30 countries, was held in Albury and was hailed a resounding success. The insert contains an overview of the conference as well as interviews with just some of the many speakers and partners with whom the Institute has connections. We also welcome Dr Damian Michael who has joined the LTIM Murrumbidgee project team and made an exciting discovery on his first field trip out. Also check out the In the News section where we capture members' media responses to news of the fish deaths in the Darling River earlier this year and Dr Jonathon Howard's Opinion piece on what is happening to our environment. Highlights in this issue would have to be an updates on a number of projects including a new project in Laos where ILWS researchers are partnering with the Xayaburi Power Company Ltd who are building a multi-billion hydro-power plant on the Lower Mekong River; a project looking at how a connection of the Murrumbidgee River with its floodplain influences food resources for native and invasive fish (after a delivery of environmental water to Tala and Yanga Lakes in September); and the start of a project that will inform the development of more sustainable management practices of Australia’s endemic sandalwoods. And, as a way of learning more about our members and their diverse research interests, check out the profile stories this issue as well as the record of engagement activities of our members at the regional, national and international level. 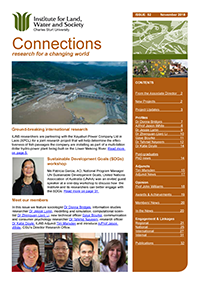 This latest issue of Connections once again shows the diversity of our members, the wide range of their research projects, some of the many ways they engage at the regional, national and international level and just generally what’s been happening across the Institute. The list of our new projects is impressive and is good mix of ecological, social and economic research. And, for those who have ever been to Kakadu National Park, the Institute Director Professor Max Finlayson’s reflections and connections to the park will bring back memories. We also welcome all our many new HDR students and profile four of our members. This issue of the Institute’s newsletter introduces members Dr James Van Dyke, Associate Professor Dominic O’Sullivan, Adjunct member Jorge Ramos, our new post-graduate students and has a profile story on Dr Rik Thwaites, who has retired. As well find out about continuing research work with Snowy Hydro Ltd related to Snowy 2.0; updates on various projects including one where our researchers are working with Indigenous groups; and the discovery of eel-tailed catfish larvae in the Edward-Wakool River System. Plus members’ engagement activities at the regional, national and international levels and a full report on the ILWS book launch held in February. This issue also happens to be the 50th issue of Connections! This issue, more than ever, shows the diversity of our members and their research work. There are profile stories on some of our newer members such as Associate Professor Maree Bernoth, who describes herself as a “Researcher of Ageing” (check out her Opinion Piece on Ageing – who cares?) As well there are stories on what are Adjunct members are doing such as Professor Jay Punthakey, a key member of the ILWS team working on the groundwater and salinity projects in Pakistan. Add to that photographs from last year’s PhD graduations; new projects and project updates; our regional, national and international engagement activities; recent publications…..and from our previous Associate Director Associate Professor Catherine Allan a reflection on the Institute itself. The 48th issue of Connections is full to the brim with lots of news. It includes details of our newest projects, updates on current projects, our members' many and varied engagement activities at the regional, national and international levels, an Opinion Piece by Associate Professor Dominic O'Sullivan on "Closing the Gap" reforms, a Profile Piece on Associate Professor Susan Mlcek from the School of Humanities and Social Sciences as well as Awards & Appointments, news from our postgraduates and publications. This edition includes information on how Institute members engage at the regional, national and international scales with details about various activities such as events, presentations, workshops and community engagement that Institute members have been involved in over the past four months. There's also a new section on Research Impacts as well as updates on new, current, and completed projects; publications; postgraduates; and articles looking at the contributions of Professor Gary Luck and Professor John Blackwell. Our researchers have certainly been active on the international scene of late with major projects underway in Pakistan, Bhutan and Laos. This issue contains updates on these projects as well as information about some of our new projects including a shark study, optimal designs for growing cities to conserve biodiversity, and a three-year ARC Discovery Early Career Researcher Award ($372,000) for Dr Dale Nimmo which will see him looking at Indigenous burning regimes and the effects on biodiversity. There is also a report on a Biocultural Knowledge workshop that the Institute held towards the end of last year, lots and lots of news from our Adjuncts, an Opinion Piece by new PhD graduate Dr Wes Ward on communication and international research teams, congratulations to all our PhDs who graduated last year and other PhD news. This edition of the Institute's newsletter Connections is an excellent indication of the diversity our members and the variety of the research projects they undertake. It contains articles about a research project funded by NSW Police to assess the rick to officers being exposed to licit and illicit drugs in the workplace; the additional monitoring being undertaken by researchers in response to flooding in the Murray-Darling Basin; a social research project originally aimed at raising awareness of sustainability through art that has grown to become so much more; research underway in Laos and in Pakistan; a project to secure safe drinking water for regional Australia; findings from a project which aims to enhance the well-being of older Australians by improving urban parks as well as information about conferences and workshops attended by members, research activities, the latest from our post-graduates and much more. Check out the latest information on a number of the Institute's new, current and completed research projects including the findings of the blue green algal monitoring done earlier this year by members of the Edward-Wakool LTIM team; about connectivity analyses for Slopes to Summit project and outcomes of the B SAFE project in the Blue Mountains. The Profile story this issue is about Institute Adjunct Professor Peter Waterman who, together with Institute Director Professor Max Finlayson, is working on a SEGRA Challenge project to secure safe drinking water for regional Australia. And there's lots of contributions too including Professor Adam Steen's Opinion Piece on the 2016 Federal Election; Institute Adjunct Dr Tony McDonald's snapshot of climate change as it relates to south-east Asia and Dr Nathan Ning's column 'Publications Under the Microscope'. Find out what our researchers are doing to help solve the puzzle of the blue-green algae bloom; what they are discovering as part of an ARC Discovery project on ecosystem services in agricultural landscapes; read about a study on black robins in the Chatham Islands and how it will inform a reintroduction attempt of this endangered species; see how researchers have mapped climate refuges in the Murray-Darling Basin; get updates on our projects in Laos, Pakistan and a new project in Bhutan that will help the globally threatened red panda; check out our members' awards and achievements, and our latest grants and publications; and there's lots more. From the story of one of Australia's most ubitiquous building materials, corrugated galvanised iron, to the discovery of a threatened species of frog and a tiny native fish at environmental water monitoring sites, to a new project in Laos looking at the social and economic benefits of fish passage ways in the Mekong Basin, to a survey of Corowa residents that will lead to the development of practical sustainability projects this issue of Connections , with updates and reports from most of the Institute's Strategic Research Areas and Research Themes, highlights the breadth and diversity of the research undertaken by our members. It also includes reports on the ILWS annual book launch last year, our presence at the Sustainable Economic Growth for Regional Australia conference last year, our PhD students who have graduated, profile pieces on our new members Dr Lee Baumgartner and Dr Jodi Price, ILWS adjunct Dr Paul Forbes, a summary of the CSU Research Centres' Review Report as it relates to ILWS, details of new projects, latest publications. In this edition we welcome five new members to the Institute including animal ecologist Dr Dale Nimmo whose broad interests are in how 'big' disturbances such as fire, drought and land clearing, influence biodiversity. As well we list 15 new Institute projects that have received external funding this year, as well as three projects that have received internal funding from CSU. While the majority of the funding is for ecological projects, some of which will contribute to our major environmental watering projects, there are also new social, educational and regional development projects. Also in this issue is an impressive list of recent publications including in well-regarded journals such as Biodiversity Conversation, Proceedings of the Royal Society of London B, PLOS One, Trends in Ecology and Evolution, and BioScience, as well as our regular features such as conferences, seminars and workshops members have attended and reported on, news from our PhD students, and examples of the community engagement our members undertake. Check out all the latest news from Institute members including that work that Associate Professor Dirk Spennemann is doing on the cultural heritage of nuclear power plants; updates on a number of research projects including the findings from a project looking at "Community Connections" in the Blue Mountains; updates from the Institute's various Strategic Research Areas including information about Wetland and Conservation Management research and a new emerging SRA on Spatial Science Research in Environment, Agriculture and Health; wonderful examples of how our members are engaging with the community; a story about Associate Professor Margaret Woodward's installation in Melbourne "The Sea is All Around Us"; PhD news; new member Dr Johanna Fawkes; publications including information about a new book co-edited by Associate Professor Rosemary Black Adventure Programming and Travel for the 21st Century......and more. In this edition you will find details of our new projects, a message from the Institute's new Associate Director Dr Catherine Allan, a report from the Sustainable Business Development in Regional Australia SRA on its various projects, information about a new Fish Ecology unit, coverage of the launch of the Institute's two major water monitoring projects, a story from Associate Professor Rosemary Black about her SSP Leave in Africa, an Opinion Piece from Associate Professor Ian Lunt about why researchers are so bad at sharing their research, an excellent example of community education in the form of a wild pollinator count....and much more. This issue includes a feature on two new major projects for the Institute funded by the Commonwealth Environment Water Office (CEWO) which have a combined value of almost $7 million. They are Long Term Intervention Monitoring (LTIM) projects (five year) for the Murrumbidgee river system and the Edward-Wakool river system. Also included in this issue is coverage of three events the Institute has held over the last few months; welcomes to new members; and an Opinion Piece from the Chair of the Institute's Advisory Board John Williams on water reform in Australia. The Institute's new Strategic Research Area – Food Security and Regional Australia is featured in this edition. You will also find details on our latest grants as well as project updates on some of our new and on-going projects including a study on old survey heritage trees and an international project funded by the USA Joint Fire Sciences Program; an interesting feature story by PhD candidate Jennifer Sherry who is investigating the vulnerability of a remote mountain community in Nepal that is threatened by the risk of a glacial lake outburst floods; and more. Find out about all the events the Institute has coming up over the next couple of months - a Climate Change and the Community Forum, a symposium around reviving regional rail in Australia, and a major conference on Food Security and the Murray-Darling Basin: Prospects, Opportunities and Challenges. In this edition you'll find updates on a number of our projects, a feature story on two of our researchers, Dr Melanie Massaro and Dr Alison Matthews who spent six weeks in the Antarctica last season studying the effects of climate change on the Adelie penguin, updates from our SRAs, as well as Institute events, publications, PhD news and more! Inside you'll find all the latest news from the Institute include updates on some of our many research projects, the latest happenings from our Strategic Research Areas, details of PhD graduates and new students for this year, an interesting Opinion Piece from A/Prof Andrew Rawson on the growing gap between Europe and Australia on actions and public engagement on climate change, emissions reduction and renewable energy, and well as a feature story on one of our most-loved and respected adjunct members Professor David Mitchell. Check out all the latest news including views from the Director Prof Max Finlayson on how we measure the Institute's success; from chair of the Advisory Board Prof John Williams on how the Institute might find its role in the sustainable development of regional Australia; and from Associate Director A/Prof Vaughan Higgins on food security and ILWS. As well there is the latest news from three of the Institute's SRAs with the updates on the activities and achievements; a Profile piece on A/Prof Peter Simmons from the School of Communication and Creative Industries; and reports on recent Institute events and our overseas visitors. This issue features the various research projects the Institute is undertaking in the Lachlan catchment in central NSW as well as reports on Institute events held this year including a workshop on needs for conserving and managing important wetlands held in Melbourne; and the regional rail revival seminar held in Blayney, NSW. There is also a profile piece on Dr Andrew Hall, a member of the Sustainable Water SRA and introductions to some of our new PhDs. This bumper issue contains all the latest news about the Institute and its members including the success of members of the Sustainable Water SRA in securing two major contracts to monitor environmental watering in the Edward-Wakool and Murrumbidgee River systems over the next 12 months. As well there is a profile on Dr Yapa Bandara, who is based at CSU's Wagga campus; introductions to all our new PhD students, many of which come from overseas and our new post-doc Dr Anna Navarro from Spain; stories on our international visitors and much much more. This issue of Connections features how the Institute is making a difference in the global context with examples of the international reach of our research. These include being published in high-quality journals and contributing to important world-wide reports. Other features include the research work being undertaken by a Masters student on a threatened fish species and reports on some of our many research projects. The May issue of Connections is filled to the brim with all the latest happenings from around the Institute, not the least of which was the launch of a new book Landscape Logic: Integrating Science for Landscape Management by CSIRO Publishing. The book which was launched by Institute adjunct Dr John Williams in Wodonga on May 2 was co-edited by Prof Allan Curtis with Institute members contributing to five chapters. Also in Connections and not to be missed is a straight- forward response by Institute adjunct Barney Foran to the Planet Under Pressure Conference he attended in London. Then there's a profile piece on new Institute Associate Director Dr Joanne Millar; a story on the fascinating PhD research by Maggie Watson into the world of ticks and lice…and much more. Featured in the latest issue of the Institute's quarterly newsletter is the recently completed Focus Farm Wetland Study. This $257,000 project, which was funded by the Murrumbidgee Catchment Management Authority, was the first major collaborative research project between the Institute and the University's EH Graham Centre for Agricultural Innovation. 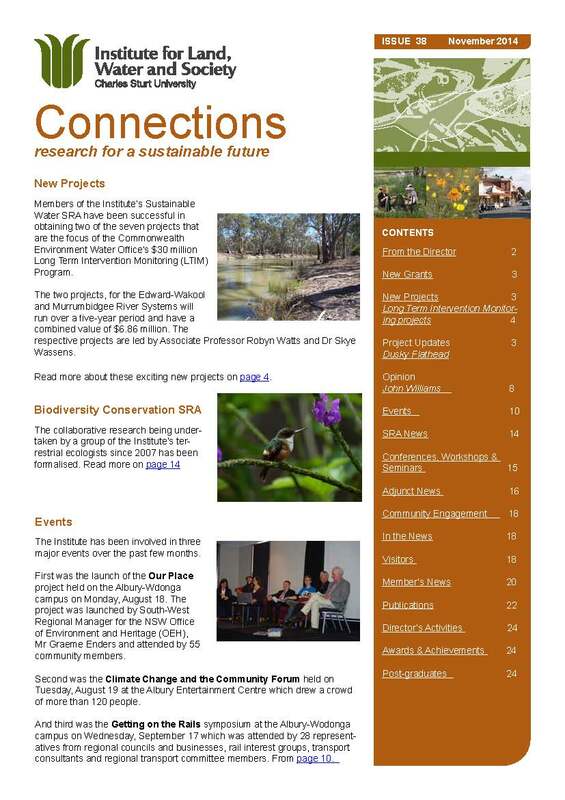 Also featured in the newsletter are Institute members Dr Peter Spooner, an ecologist who is passionate about preserving Australia's roadsides and travelling stock reserves and ensuring they are recognised for their biodiversity value; ecologist Dr Mariagrazia Bellio who is working on waterbirds in China and India; and Institute adjunct Professor John Williams (former Commissioner with the NSW Natural Resources Commission) who has written an opinion piece on Integrated Catchment Management in NSW. This issue of the Institute's newsletter is filled to the brim with all the latest news including a round-up of the many visitors to the Institute over the last few months which includes a visit from a group of Indians here on a wetlands study tour. As well there's a Feature story on Institute adjunct Michael Vanderzee and his role as CEO of the Winton Wetlands Committee of Management which is restoring what was Lake Mokoan in NE Victoria and details of an ILWS organised Ecosystems Workshop, with a particular focus on the Murray darling Basin, held in Canberra in August. Improving Rural Livelihoods and Environments in Developing Countries, Innovative Perspectives on Energy, Ecosystems Services, Sustainable Water. This bumper issue of 'Connections' is our 25th . Special features include stories on two of the Institute's Strategic Research Areas - Ecological and Social Responses to Native Plant Regeneration in Dynamic Rural Landscapes, and the new Improving Rural Livelihoods and Environments in Developing Countries. As well there are profiles on new sociology associate professor Vaughan Higgins; Prof Kishor Sharma from the School of Business; and Dr Jan Pokorny, a Czech scientist who visited the Institute earlier in the year. Of special mention would have to be our PhD students. The Institute welcomes another five PhD students and congratulates this year's graduates…all 17 of them! This issue includes comments frommembers on the floods we have been experiencing as well as a special feature on the Institute's Ecosystems Services Strategic Research Area. This issue's profile piece is on ecologist Dr Skye Wassens, who is based at Wagga, with an extensive report on the research she is doing on frogs in the Lowbidgee. As well there are stories on new PhDs, new post-graduate appointments, Institute visitors and Institute events including the launch of A/Prof David Watson new book "Mistletoes of Southern Australia." This issue of Connections features two Strategic Research Areas – Innovative Perspectives on Energy and Climate Change from Socio Historical Analysis (IPE) and Social Research for Regional Natural Resource Management. The breadth of research knowledge and expertise is highlighted in the profiles of our members Dr Andrea Crampton, who is interested in the application of effective technologies in teaching science and Prof John Hicks who is working on a new research project on assisting transition in regional areas that are affected by drought and climate change with a particular emphasis on those areas that depend on irrigation. Features on ILWS postgraduates Wayne Deans, Manu Saunders and Janet Cohn, as well as updates on our events, news all make for interesting reading. This issue of Connections is packed with all the latest Institute news including special features on two of its new Strategic Research Areas – Adaptive Management of Water Policy, Planning and River Operations; and Social Aspects of Climate Change Adaptation. Also included is a Media Statement "helping Muray-Darling Basin Communities live with less water in the future" signed by 27 Institute members and adjuncts which was released on July 28. This issue of Connections includes a special feature on the Institute's Strategic Research Areas as well as all the latest Institute news, publications, grants and up-dates on member activities. Prof Max Finlayson reports on his visit to the Okavango Delta in Botswana and Dr Kerry Tilbrook is featured in a profile piece as a member of the SRA on the "Social aspects of climate change adaptation." This issue contains a thought-provoking opinion piece by A/Prof Pierre Horwitz from Edith Cowan University on "Wetlands and Human Health." As well there are profile pieces on ecologist Dr Iain Taylor who jas just returned from taking a group of CSU students to Nepal; economist A/Prof Geoff Bamberry; Institute advisory board member Ken Matthews who is the Chief Executive of the National Water Commission; and Institute adjunct Dr Kevin Warburton, an ecologist with a special interest in fish behaviour and memory. The regular sections Visitors & Visits, and Institute Events are full of the latest news and check out our Indonesian PhD students and visitors in the International section. Another very interesting edition. Dr Helen Masterman-Smith headlines the November issue of 'Connections' with an Opinion piece outlining her hopes that public investment in 'green jobs' will deliver not only ecologically sustainable, but decent work options and protections for low paid workers. A/Prof Gary Luck reveals what he'll do during the four years of his recently awarded and highly prestigous Australian Reserach Council Futures Fellowship. There's also Profiles on Advisory Board Member Cathy McGowan, ILWS adjunct Dr Nick Davidson and fish researcher Dr Paul Humphries. Stories on five of ILWS's PhD students students cover areas ranging from serrated tussock to country train services to the swimming ability of fish larvae. As always 'Connections' is well worth a read. Our Winter edition is full of stories about the amazing work our researchers and PhD students are involved in. Find out what members Yalmambirra, Jon O'Neill and Helen Masterman-Smith are researching and what adjunct Dr Justin Watson is up to. There's an Opinion piece by NSW Natural Resources Commisioner, John Williams and a profile on Advisory Board member, Wendy Craik. Plus information and reports about Institute activities and events, the latest publications by Institute members as well as our latest grants. This is a 16 page bumper edition! This is edition features fantastic articles on ILWS's researchers Dr Di Boxall and Dr Rosie Black; PhD students Jane Roots, Bugi Sumirat, Eloise Seymour and Emily Sharp, which detail their current research fields, backgrounds and future aspirations. There's an Opinion piece from Professor of Integrated Environmental Management, Prof Allan Curtis, an update on member activities and visitors to ILWS for the quarter. A great read! The first issue for the year is packed with stories about the Institute, including an opinion piece by Advisory Board chairman, Dr Denis Saunders and profiles on researchers Jonathon Howard, Andrea Wilson and Debra de Silvaa.There is also a report on Institute events and visitors as well as a story on new Advisory Board Samantha Edmonds, and features on a number of PhD students and their fascinating work. The final issue for the year includes information about changes to the ILWS Advisory Board, a thought provoking opinion piece by a visiting academic on how food wasteage is also a waste of water, plus reports on the many other visitors passing through ILWS this quarter. There's a profile on spatial scientist Dr Remy Dehaan, PhD's student Ian Cole and Wendy Minato and an extensive run down on Institute events held during the past 3 months. This issue is full to the brim with all the latest Institute news - visitors and visits, new publications, new research grants, events, news from two of our Integration programs...as well as profile pieces on some of our PhD studednts, Dr Laura McFarland from the Communication, Arts and Education group, Dr Pk Basu from the Economics and Regional Development group, and Institute adjunct Dr Tony McDonald. In this issue Dr Wendy Craik, who is on the Institute's advisory board, gives her views on women in the water industry in Australia. Wendy is also the chief executive of the Murray-Darling Basin Commission. As well this issue has profiles on her fellow advisory board member Vic Keighery, ILWS adjunct research fellow Dr Rod Griffiths and ILWS members Patty Please, A/Prof Andrew Keen and A/Prof Ian Gray. It's been a busy start to the year with lots happening and a new director, Prof Max Finlayson at the helm of the Institute. Find out more about Max and where he has come from in a feature story on page 8. This issue also has profiles on Dr Denis Saunders, chair of the Institute's Advisory Board, adjunct research fellow Nicki Mazur as well as stories oin a number of PhD students and their work. Another 'bumper' issue of the newsletter which really does showcase the breadth of the research undertaken by Institute members. This issue has profiles on Dr Roderick Duncan, Dr Robyn Mason and John Rafferty as well as lots of news from the Institute's various discipline groups, Integration programs and updates on our PhD students. This 'bumper' issue contains lots of Institute news including an extensive list of member publications list, feature stories on Elaine Dietsch and Barney Foran, a profile of new postgraduate Sylvia Zukowski, news on Dr Jim Birckhead's work activities since his 'retirement' three years ago and more! This issue includes a message from the Institute's director Prof Allan Curtis who is stepping down from this role on July 1; a profile on Dr Jenny Sappey, a member of the Institute's Economic and Regional Development Group; reports on members' various overseas trips, and mention of the many Institute visitors over the last few months. This issues profiles the Institute's new Professor of Innovative Agricultural Water Technologies, John Blackwell, a member of the Water Systems group; has Prof Kevin Parton discussing the importance of establishing a system of getting the right prices of environmental resources; welcomes our new PhD students and business manager Roni McDowell; as well as all the regular features such as in the News, Publications, reports on Conferences, Seminars and Workshops members have attended, or are coming up; and news of the latest Research Grants. In this issue, in the Opinion piece, Dr Paul Humphries expresses his concern that the current drought could have on future fish populations; there is a profile on recently promoted Assoc Prof Robyn Watts; a report on the Institute's highly successful public forum on global warming; and a report on research fellow Dr Tony McDonald's involvement in the post-tsunami rehabilitation processes in Aceh, Indoensia. In this issue, the Institute director Prof Allan Curtis gives an update on how the Institute performed in 2005; Prof Kath Bowmer, in the 'Opinion' piece, discusses different approaches to research; there is a report from four of the Institute's discipline groups and on one of its integration programs; a profile on the Institute's newest Research Fellow Daryl McGregor; a list of the Institute's new PhD students and a report on Dr David Roshier's recent trip to Siberia. This issue contains a report from Institute director Professor Allan Curtis on integration across ILWS and a planning day that was held to explore ideas for three ILWS integration programs; stories on two of the Institute's discipline groups- Water Systems Group, headed by Professor Shahbaz Khan, and the emerging Arts, Communication and Culture group headed by Kevin Poynter; a profile piece on ILWS Principal Researcher and ecologist Dr David Roshier; as well as regular sections on the latest publications put out by members, media coverage they have received, conferences they have attended and grants they have obtained. This issue features a report from the Institute director, Professor Allan Curtis on the first meeting of the ILWS Advisory Board; an opinion by Assoc Prof Mark Morrison, leader of the ILWS Economic and Regional Development group on "What Should We Expect from Market-Based Instruments"; a feature story on ecologist Dr Gary Luck from the School of Environmental and Information Sciences; and a story on the new Ecology discipline group within the ILWS. This issue gives a report by the director reflecting on what ILWS has achieved thus far and identifies some of the key activities for next year; an opinion by Prof Marg Alston, director of the Centre for Rural Social Research on "Service delivery in inland rural Australia: Human Rights abuses in our backyard"; a feature profile on tourism and recreation lecturer Dr Penny Davidson; and stories on two economists Assoc Prof Mark Morrison from Bathurst, and Professor Eddie Oczkowski, members of the emerging Economics and Regional Development discipline group. This issue with a director's report by Prof Nick Klomp, director of the Johnstone Centre, lists publications in the ILWS 2005 Annual Research Quality Portfolio; a story on Dr Manohar Pawar from the CRSR and his research on community informal care and welfare practices; a story on PhD student Amy Jorgensen and the research being carried out on Montague Island, off the NSW south coast, on Seabird Habitat Restoration; and a profile piece on Prof Kevin Parton, head of the School of Rural Management at Orange. The first issue of the ILWS newsletter includes media coverage of Institute members; a profile on Dr Lynelle Osburn, a lecturer with the School of Humanities and Social Sciences at Wagga Wagga; the Institute's new PhD students; and stories on social researcher Dr Judith Crockett from Orange; senior research fellow Dr Digby Race who is based at Thurgoona; and Ray Goodlass from Wagga Wagga who is heading up the Institute's emerging theme on Nature and Use of Knowledge and Information.